I promised to post yesterday but I fell asleep. Oops! Boy, do I have some serious knitting content for you! I had to send a bunch of gifts yesterday in a mad dash so I never took pictures of my mom’s sweater or my brother’s brioche hat. Neither were too exciting. The hat was white and maroon, since those are the color’s of the little brother’s college and he’s in the basketball pep band. Also, I forgot finished product photos of little cousins wearing elf stockings. 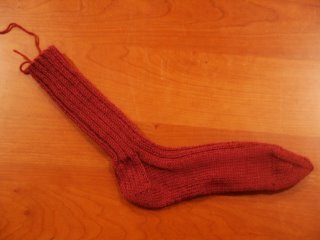 They were cute but frankly, my hands will thank me if I never use size 13 DPNs with double-stranded bulky yarn again. That was a recipe for carpal tunnel syndrome! I don’t know how big-needle/yarn scarf knitters can stand the achy wrists and hands. Maybe that’s why it seems like the trendy knitters either move on to real projects on real needles with real yarn or quit. 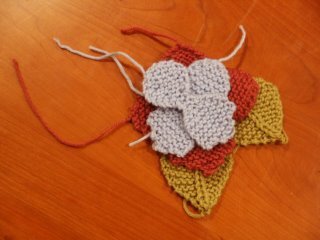 Don’t get me wrong – I don’t have anything against scarf-only knitters, I just cannot relate. 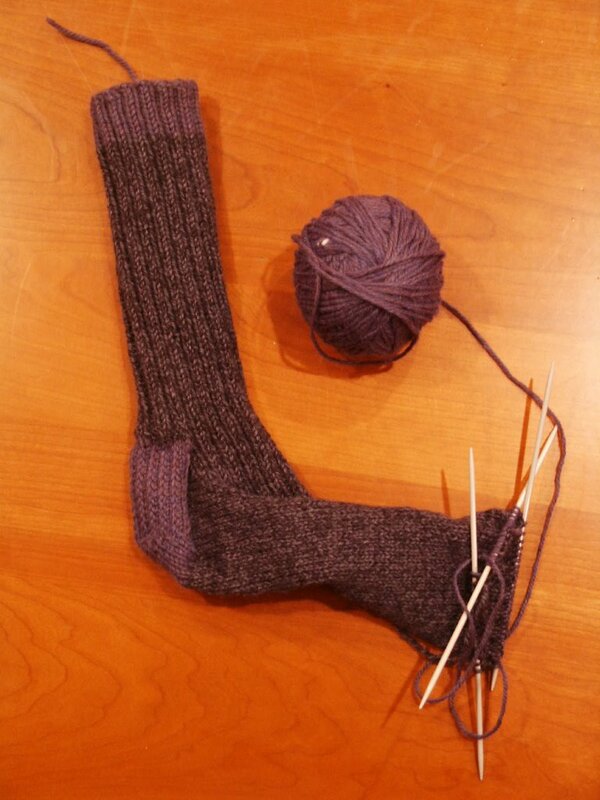 OK, so my father-in-laws socks (see dk blue/medium blue sock in progress) are taking forever. I made the mistake of swatching on sz 3 needles instead of the 6s I had intended (the yarn is worsted weight). So now I’m stuck with REALLY thick socks for a man with sz 11.5-12 feet. Ahhhhhhhhhhhhhhhhhhhhhhh! I’ve been slaving over the first one not only because I need these done by Sunday but also because I need the needles to finish my sister-in-law’s second sock (the plum-colored sock is the first in the pair). Nothing like leaving these to the last minute. In my defense, I am a graduate student so it is not as if I’ve been loafing around for the last few months! Still, in order to get the gift knitting done, I’ve rented a stack of movies including Rudolph the Red-Nosed Reindeer , the Marx Brothers’ Go West and At the Circus , Mad Hot Ballroom , State and Main and Intolerable Cruelty. Yes, I know – that’s a lot. You have to understand that we do not have tv service so movies on DVD or VHS are the only option for sedentary zombie days. I’ve seen book holders online and I plan on buying one but I just haven’t gotten around to it. I would prefer reading but as long as I’m knitting socks on DPNs, that seems a little unrealistic. I have three more pictures for you. First, the aforementioned Dr. Seuss socks that my husband doubts any sane human being would ever wear. Second, the unfelted flower pin still needing a center bobble and its ends woven in. The pin will be for my stepsister-in-law. 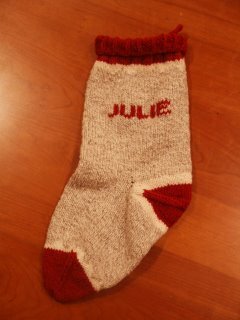 Third, a Christmas stocking I made for my friend Julie last year. Because I was an idiot and did not write down the final dimensions, I asked if I could borrow it so that I could make a duplicate for her husband. We won’t likely see them until after Christmas so they won’t have a pair of stockings until next year but I do need to make a second one for him. I went to my LYS to look for the same yarn although I didn’t see it, I was in a rush so I’ll go back later when things calm down to get some. I hope they have it. I don’t want to have to go to Kansas City (30 minutes away) for one skein of yarn. Some of you may scoff at that drive but since I’m from Massachusetts, my geography worldview is a little skewed. A half hour drive is way too long for yarn. I promise to post once the gifts are finished and before I wrap everything up. No pictures today, as I haven’t much to show for myself. I’M DONE WITH FINALS! Yay. I don’t even care how I did – I’m just happy it’s over. I had a very heavy courseload this semester so it’s a relief to be done. 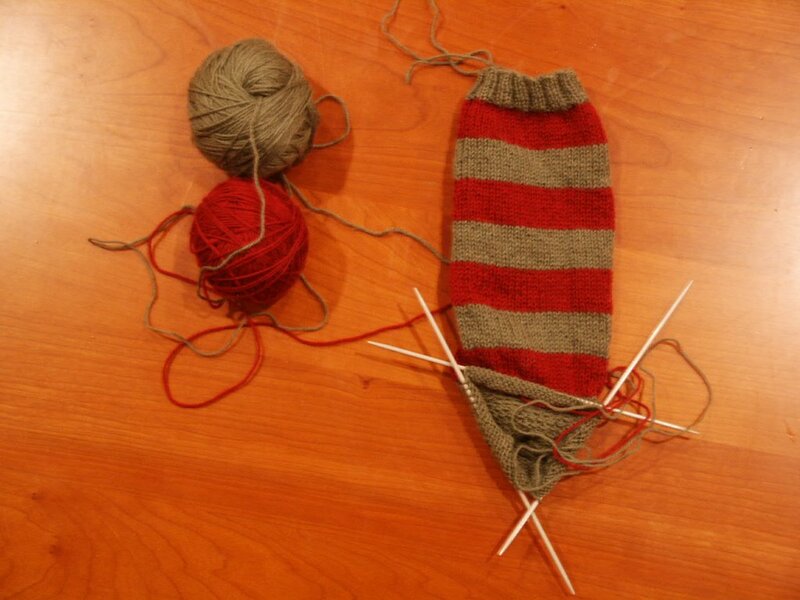 I’m at the heel of a red and green striped pair of top-down socks. I thought they would be cool stripes but the sock looks more like something out of a Dr. Seuss book. *sigh* I probably won’t give these as a present because I don’t know anyone that’s really into Dr. Seuss socks so I’ll probably keep them. I have no pride. I’ll wear red and green striped socks. In response to some emails, the Lapland Mittens are from Folk Mittens. The fingerless mitts are from Weekend Knitting but you can find similar patterns for the fingerless mittens if you google them. I’ve seen lots of cute freebie patterns for them. I’m planning a new brioche hat but I’ve found a better crown shaping method at Tipper’s blog. Her version is cleaner than Melanie Falick’s and looks much easier. So FYI, if you start a brioche hat, go get Tipper’s quick and dirty crown shaping!